- Velour pads and sheets. Pastell Sketch is a 130 gsm 100% Cotton Rag paper. This high quality pastel paper has a semi rough grain and is natural white in colour. It is available in both A4 and A3 pad sizes, each of which has 30 sheets. PastellFix is a 170 gsm paper with a cotton rag content which has been designed spacifically for pastels. The paper has a very soft and flat, felt type feel but is very strong at the same time. Very little pressure is needed for the pastel to settle into the paper which is excellent for blending. The flat surface also allows for fine lines without the stroke breaking as can happen on rougher surfaces. The flat surface also provides a good base for pastel pencils. A good degree of layering can also be achieved before the paper is exhausted, five or six layers is achievable. Pads are available in three sizes, 24x32cm, 30x40cm, 36x48cm. Each pad has 12 sheets of Pastellfix with two each of Ivory, Sand, Navy, Steel Grey, Dark Grey, and Black. 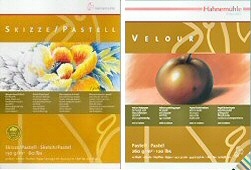 Hahnemuhle Velour Pastel Paper is a 260gsm pastel paper with a wonderful soft surface. The velour is applied generously and consistently to a smooth acid-free paper to create a very soft and velvety working surface. Pastels go onto the paper with ease and colour can be layered very well. Pads of 10 sheets are available in three sizes which are 24x32cm, 30x40cm and 36x48cm. Individual sheets are available as a half sheet measuring approximately 50x35cm or a full sheet measuring 50x70cm. Hahnemuhle Velour Pastel Paper is available in ten colours, white, yellow, orange, green, sand, ochre, light grey, medium grey, dark grey and black. The assorted pads contain all ten colours.